Over the years, many baseball stadiums have been built right next to the stadiums which they replaced, and in two cases (St. Louis and Cincinnati) the two successive stadiums "overlapped" each other. In other cases, stadiums were built just a few blocks from their predecessors. This page depicts all such cases of close stadium proximity by means of special dual-thumbnail images in which the individual diagrams have been rotated so that north is always straight up. To see the stadium images, roll the mouse cursor over the city names. (For New York, Chicago, and Los Angeles, there are separate thumbnail images for the American League and National League teams, depending on which part of the city it is.) The "Western," "Central," and "Eastern" columns are based on geography, not the actual league divisions or time zones. To go to the page of that city's current stadium, click on the city name. For cities in which there was no close stadium proximity, rolling over the city names will display a standard thumbnail image of the current stadium, along with a text box showing its name, year of origin, and the previous MLB stadium (if any), and the distance in miles between the two. In a few cases, the name of and distance to the stadium one more generation back is shown as well. Where applicable, the names and/or thumbnail images of NFL stadiums or NBA / NHL arenas are shown as well. Unlike the baseball stadium thumbnails, those images are mere rough approximations. Eventually, this page will provide such information for all major league stadiums since the early 20th Century. ( ! ) : Special adjacent-stadium thumbnail diagram. Roll mouse over city locations. Replaced (adjacent) Kingdome. That site is now occupied by Century Link Field, home of the NFL Seattle Seahawks. Replaced Candlestick Park *, about 5 miles to the south. Home of the Athletics (and NFL Raiders) ever since the franchise relocated from Kansas City in 1968. Adjacent to Oracle Arena, home of the NBA Golden State Warriors. Replaced Memorial Coliseum, about 5 miles southwest. After four years of cohabiting in Dodger Stadium, about 30 miles west-northwest. About 1 mile southwest of Honda Center (1993- ), home of the NHL Anaheim Ducks. Replaced Jack Murphy Stadium*, about 6 miles north-northeast. Built for the Arizona Diamondbacks expansion franchise. Replaced Mile High Stadium, about 1.5 miles west-southwest. About 1/2 mile northeast of Pepsi Center, home of the NBA Denver Nuggets and NHL Denver Avalanche. Rplaced the Metrodome (1982-2009), about 1 mile east-southeast; adjacent to Target Center, home of the NBA Minnesota Timberwolves. Metrodome replaced Metropolitan Stadium (1961-1981), about eight miles south. Replaced (adjacent) Milwaukee County Stadium (1953-2000). Replaced West Side Grounds, about 5 miles south-southwest. Replaced K.C. Municipal Stadium (1955-1967; 1969-1972), about 4 miles northwest. Adjacent to Arrowhead Stadium, home of the NFL K.C. Chiefs. Replaced (overlapping!) Busch Stadium II (1966-2005), which replaced Busch Stadium I, a.k.a. "Sportsman's Park (1910-1966), about 2 miles north-northwest. Replaced Arlington Stadium (1965-1993); about 1 mile east-northeast of AT&T Stadium, home of the NFL "Dallas" Cowboys. 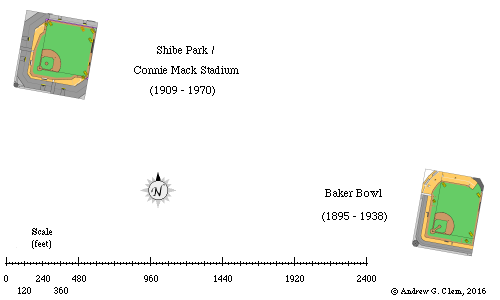 Replaced Astrodome (1965-1999) and the adjacent Colt Stadium (1962-1964), about 6 miles south-southwest. NRG Stadium, home of the NFL Houston Texans, is adjacent to the Astrodome. Replaced Tiger Stadium (1912-1999), about 1 mile west-southwest; adjacent to Ford Field, home of the NFL Detroit Lions. Replaced Cleveland Stadium, about 1 mile north. Adjacent to QuickenLoans Arena, home of the NBA Cleveland Cavaliers. Replaced (overlapping!) Riverfront Stadium (1970-2002), which replaced Crosley Field (1912-1970), about 2 miles northwest. Paul Brown Stadium (2000- ), home of the Cincinnati Bengals, is two blocks to the west. Replaced (nearby) Three Rivers Stadium (1970-2000), which replaced Forbes Field (1909-1970), about 3 miles southeast. Heinz Field (2001- ), home of the Pittsburgh Steelers, is two blocks to the west. Replaced Jarry Park, about 4 miles west-southwest. Replaced Exhibition Stadium, about 2 miles west-southwest. About 1/2 mile (west-northwest) from Air Canada Centre, home of the NBA Toronto Raptors	and the NHL Maple Leafs. Replaced Huntington Avenue Baseball Grounds, about 1 miles south-southeast. Replaced (adjacent) Yankee Stadium (1923-2008); after ten years (1913-1922) of cohabiting with the New York Giants in the Polo Grounds, about one-half mile west-northwest. Before that (1903-1912), the "Highlanders" (as the Yankees were then called) played at Hilltop Park, about 2/3 mile north-northwest of the Polo Grounds. Replaced (adjacent) Shea Stadium (1964-2008), which replaced Polo Grounds (1962-1963), about seven miles northwest. Replaced (for Athletics) Columbia Park (1901-1908) and (for Phillies) Baker Bowl (1895-1938), about a half mile east. Replaced (adjacent) Veterans Stadium (1971-2003), which replaced Connie Mack Stadium, a.k.a. Shibe Park (1909-1970), about five miles north. Replaced Memorial Stadium (1954-1991), about 3 miles north-northeast. Adjacent to M&T Bank Stadium (1998- ), home of the Baltimore Ravens. Replaced RFK Stadium (1962- ), about 2 miles east-northeast. RFK Stadium replaced Griffith Stadium (1911-1961), about 3 miles northwest. Replaced Dolphin Stadium, about 12 miles north. On the same site as the former Orange Bowl (1935-2008). Inherited by the Tampa Bay Rays expansion franchise.